Axiom just released its latest driver, a 6.5"-woofer that was borne of an almost ground-up rebuild by engineer Andrew Welker. Here is his description of what changes the woofer underwent under his direction, and what you can expect to hear going forward. 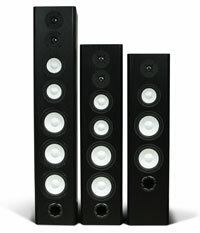 Andrew Welker: Ian recently made an announcement on the message boards about a new high-powered woofer for the LFR Omnidirectional Speaker and a new model that is going to be coming out shortly called an M100. He's asked me to explain what went into building the new woofer. When we developed the LFR, which was the first system we did with three woofers, we got amazing reviews and incredible feedback. But we're always striving to improve things. One of the areas I started looking at was our 6.5"-woofer that we've been using for many years in our M80 and other speakers. There's always a number of areas that you can improve, and in a discussion with Ian I wanted to take the already-high power handling level of the woofers that we're using in the M80 and the LFR to another level. 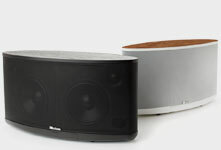 We thought it would be a good time to actually introduce that woofer in a brand new model called the M100. 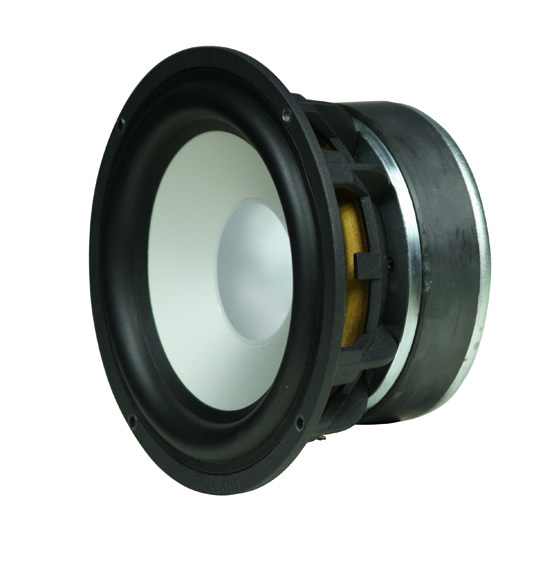 The biggest change between the current 6.5-inch woofer and the new woofer is in the voice coil. This is really the element, along with the amplifier and the magnetic motor system of the woofer, this is what is doing the work to move the cone. The new voice coil is 1.5" in diameter rather than 1-inch like the current woofer. That means it's got more copper wire on it and it also has a larger aluminum former that the coil is wound on. What that means is that coil can dissipate more heat, and heat is really the enemy when you're driving a woofer at high levels. Woofers and tweeters are naturally fairly inefficient: they only convert fractions of a percent (up to a couple percent in higher efficiency drivers) of the actual amplifier power energy into acoustic energy. The rest of that is lost in heat. So dissipating heat is very important and it's one of the reasons we increased the voice coil size for these new woofers. 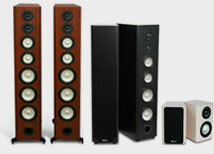 Now the penalty of increasing the diameter and size of the voice coil is that the weight goes up. 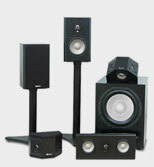 More weight means the woofer is going to have less output unless you compensate for it. The way you compensate for it is that you increase the magnetic strength of what's called the 'motor'. The motor consists of three parts: one is called the top plate, then there is a ceramic permanent magnet, and then there is a t-yoke. Now, all of these parts are significantly larger than the previous 6.5"-woofer. This is simply to overcome the additional mass that we're dealing with in the larger voice coil. Along with the bigger motor system and bigger voice coil, we wanted to increase what's called the xmax or the linear travel. That tells you how far the woofer can move up and down before it starts to come out of the magnetic field. As soon as that happens, the distortion goes way up, and you want to avoid that. So having as much linear excursion or xmax is always a good thing: it means you can drive the woofer harder with more power and not get high levels of distortion. Part of that was achieved through the winding length of the voice coil  the amount of wire that's wound on the voice coil former. We were also faced with the limitation of how far the surround of our current cone would stretch. So even if we made the voice coil longer, we would get more travel, but it would stop at some point when the surround was stretched to its maximum. We've actually come up with a new surround that results in almost 30% more travel than the current surround that we're using. So by changing the voice coil, we've improved power handling, we've improved the amount of linear excursion, and the new surround helps us to actually achieve that linear excursion without putting the brakes on. One of the other things that we looked at is we went to a two-part epoxy glue a number of years ago for bonding the cone to the damper or a spider, and the spider to the voice coil, and this glue allows us to achieve far higher temperatures without a failure happening. Actually in these new high-powered woofers, we're essentially embedding both of these with glue, so there's two beads of glue, and what that allows us to do is really reduce the failure rate from a mechanical rate almost down to zero. Since we've made those changes to our subwoofer drivers we've had absolutely zero failures on those drivers. You can see there are a number of areas where we have made improvements. At the end of the day, it just means the system will play even louder and cleaner before it starts making any noise from distortion. In the testing we've been doing on the LFR and M100 with these new woofers, we run out of amplifier power on an ADA1500 before the speaker gives up! So we've now got a system where there is really very little dynamic limitation and I think people will find it's a huge improvement. I had not heard of or seen the M100 till the new newsletter. - With a ceiling height of 9', what would be the smallest room square footage, the the M100 could operate without overloading the room? - Minimum sitting distance from the M100? - Is there, will there, be a DSP or 'Digital Sound Processing Box' available? - Will the new drivers be incorporated into the M80? 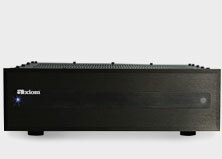 - If/will the new drivers into the M80 include an available DSP or 'Digital Sound Processing Box'? It is no problem to use the M100s in a small room, they will still sound perfect, but you may never get to the full output potential. Even though both the M100 and the M80 are a multi-driver towers you can sit pretty close without a problem. The M100 would be the same as your M80s for this. We will have code for the M100 when the optional DSP box comes available in a week or two. The thinking is to leave the M80 as it is for now. The two-driver system in the M80s would mean a different woofer from the triple-driver system used in the M100s and LFR1100s.